DURHAM, N.C. — A combination of stability and abundance may be what gives allergy-triggering dust mite proteins their sneeze-inducing power, says a new study by scientists at Duke University and the National Institute of Environmental Health Sciences (NIEHS). Of the thousands of proteins that make up your common house dust mite, only about two dozen trigger the miserable sniffling, sneezing and itching of an allergic reaction. Why people consistently develop allergies to some proteins, be they in dust mites, pollen, cat dander or cockroaches, but not to the large number of other proteins in the environment has been a long standing question for allergen researchers. 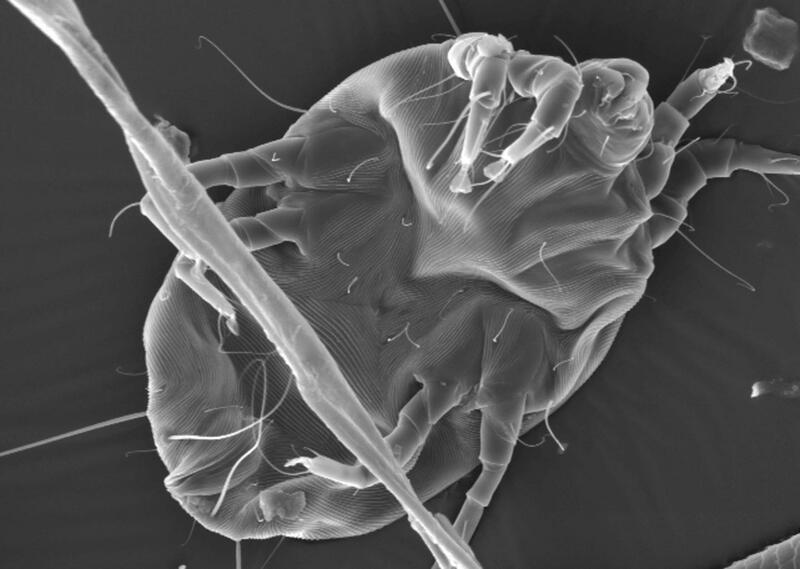 To tackle this question, the researchers employed a new technique that makes it possible to measure of the stability allergens and non-allergens in the dust mite on a large scale. "Interestingly the allergens weren't just more abundant, and they weren't just more stable, they were both more abundant and more stable," said Michael Fitzgerald, professor of chemistry at Duke University and a co-author on the study. "This helps us understand at a fundamental level why certain proteins are allergenic." The results may lead to new allergy treatments or be used to predict when proteins that are artificially added to our environments, such as those used in food, medicine or other consumer products, have the potential to become allergenic. The study appeared online Oct. 19 in the Journal of Allergy and Clinical Immunology. All proteins — non-allergens and allergens alike — are made of long ribbons of amino acids that must fold themselves up into intricate three-dimensional structures to carry out their biological functions. A protein's "stability" is a measure of how likely it is to be found in its functional folded shape. Typically, stability measurements can only be carried out on a single, purified protein, but Fitzgerald's group has spent the last decade perfecting a technique that can determine the stabilities of complex mixtures of proteins — up to hundreds or even thousands of proteins at once. "Most proteins are stable, folded three-dimensional structures, and understanding how stable they are, putting a number on that, quantifying that, can be useful in a number of different applications, from drug mode-of-action studies to characterizing disease states," Fitzgerald said. Indeed, protein stability long been considered a possible factor contributing to allergies, said Geoffrey Mueller, a staff scientist at NIEHS and senior author on the paper. Researchers thought that perhaps more stable proteins may be less likely to break down in the environment, or could be more irritating to the immune system than less stable proteins. To test this hypothesis, Mueller and Fitzgerald teamed up to measure the stabilities of 19 known allergens and 659 non-allergens in whole dust mites. Combining these results with transcriptome data, which provides the abundance of each protein, they found that the allergenic proteins were statistically both more numerous and more stable than other proteins in the dust mite. "The beauty this study is we were able to get good statistics," said Mueller. "We were able to study a lot of dust mite proteins and really look at the differences between the allergens and the non-allergens." Though the allergens were statistically different than non-allergens, they weren't unique in being highly abundant and highly stable — that is, a small number of non-allergens also shared this combination of properties. One possible explanation might be that we simply aren't exposed to all the proteins in the dust mite, and so we never get the chance to become sensitized to them, Mueller says. "Unlike pollen, we don't really breathe in full dust mites, so what you are exposed to is actually a subset of what you find in the dust mite," Mueller said. The team plans to repeat these studies in other common allergens, such as pollen and cockroaches, to see if the link holds up. "Proteins are becoming more and more widely used in various consumer products, from GMOs to therapeutic medicines," Fitzgerald said. "This may help predict which ones of those may be more or less allergenic." This research was supported by the Intramural Research Program of the NIEHS (Z01- ES102885-01) and the Extramural Research Program of the NIGMS (2R01-GM08174) and the National Institute Of Allergy And Infectious Diseases of the NIH (R01AI077653).